Because, collectively, we are terrible at being kind. And it’s a particular sort of kindness that we lack. We are not kind to ourselves. We work so hard to have grace with the children in our lives. We work so diligently to have grace with our spouses, loved ones, coworkers, friends. We pray for grace and kindness with pets, with inanimate objects. But when I’m dealing with myself? I have less than zero grace. Last week, I almost caused a car accident. I cringe as I think about it. We just moved, and the entrance to our new house is tricky to navigate. If you time your turn wrong and can’t see the four way stop not twenty feet ahead of the left hand turn, you can easily pull out in front of someone else. Which is exactly what I did. And instead of speeding up to get out of their way, I stopped and honked my horn. I have no earthly idea why I did this. But I did. And I have beat myself up about the incident time and time again. Because in my head, I should know better. I almost hurt my car. I almost hurt myself and someone else. I almost almost almost almost. And I feel ashamed. I am even less kind to my body. I’m almost 19 weeks pregnant, and my middle is growing. I have turned into a teenage boy on the hunger scale. And I see myself gaining weight. And it’s so hard to accept that gaining weight is a good thing in this context. Because in my mind, it’s always been a bad thing. I already have stretch marks. I have this fun hip pain at the end of every day that keeps me from unpacking as much as I want to. I cry all the time, even more than I did before. And I expect myself to not need any extra rest. I expect myself to have a super energetic pregnancy. My expectations are unrealistic, and I am holding myself to a standard that I cannot and should not be able to achieve. The other day, an unsuspecting friend asked me how I was doing. And she got an earful (via text) about how dumb I was being because I’m emotional, I’m not handling things well, and so on. And she was quick to point out how many times I used the word “dumb” in reference to myself. And then this lovely friend told me “This is normal. You’re pregnant. You’re doing a good job.” And I just about cried. (Lie; I actually in-real-life cried.) She had kindness for me when I had none for myself. And I want to pass that nudge along to you. You’re not perfect. You’re not supposed to be perfect. God created you, and knows all of your flaws. He’s not surprised when you mess up. He’s not surprised when you don’t do well. Now, that’s not license to stop trying. But it is license to be kind to yourself. Sometimes, kindness is asking for help or encouragement. Sometimes, kindness to yourself is accepting a failure, dusting yourself off, and trying again. 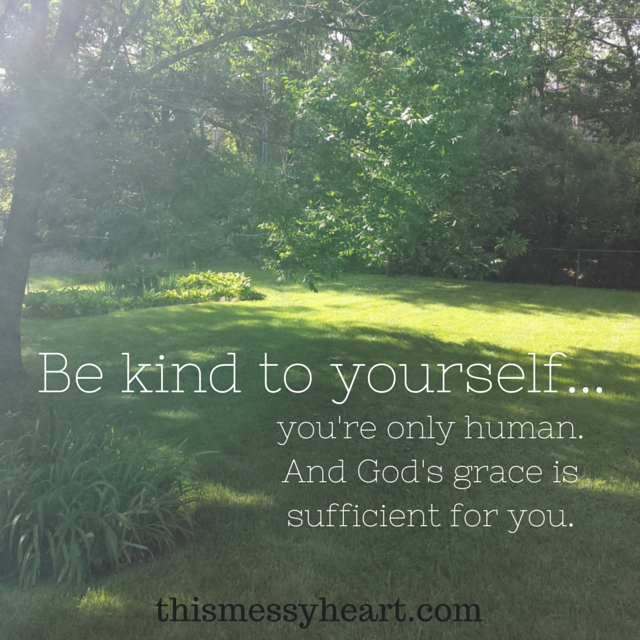 And sometimes kindness is giving yourself permission to take a break and rest. Sometimes, kindness is working to accept who you are and where you are in life. “But he said to me, “My grace is sufficient for you, for my power is made perfect in weakness.” Therefore I will boast all the more gladly of my weaknesses, so that the power of Christ may rest upon me.” 2 Corinthians 12:9 (ESV). Praise God for our failures and weakness. Praise God for His grace and kindness. How do you need to show yourself kindness? Please, be kind to me. Work to show me as much grace as you work to show others. I am fearfully and wonderfully made in God’s image, and I deserve kindness.